Enjoy the rich scent of … oops!... there is no scent in this moisturizing and cleansing formula with Olive Oil and Aloe. Great for sensitive skin. Best of many I have tried. Excellent soap with no fragrance. I've tried many different soaps with no fragrance and this is the best. This product is very nice, gentle and I would have given it 5 stars apart from this odd thing where when I smell it I feel sick to my stomach. Strange to have a reaction to something fragrance-free, but I have a sensitive sniffer and I may react to anything. It was also just a bit drying. I bought many Kiss My Face products as a gift for my Mom and she loved them all!!! Excellent product for people with chemical and scent allergies! Good soap and moisturizing. Wonderful fragrance free product, will definitely purchase again! This is a favorite conditioner for me. It's gentle and does not trigger my allergies to fragrance. Thank goodness for a scent free soap that is truly scent free! This is gentle and has a good lather. I've already added it to my wish list for easy finding. Thank heavens for a fragrance free liquid soap that is gentle and doesn't trigger my allergies. Wonderful product, gentle and moisturizing. 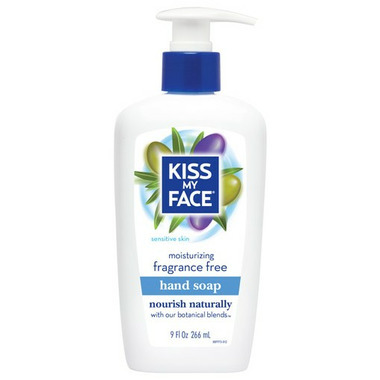 I use it as an intimate wash after KISS MY FACE has unfortunately discontinued the liquid almond soap. This is the only soap that doesn't dry out my daughter's skin. I also like that it is fragrance free because there are people in my family with scent allergies. I purchase this product because it is scent free and it is not drying. I have tried a lot of fragrance free products especially soaps, trying to find one that cleans without leaving an after smell on my hands. This one does just that. It cleans, lathers well and does not leave a smell on my hands. I also find you do not need to use a full plunge at a time and the soap lasts much longer. A half a plunge does well for regular handwashing. This soap is very moisturizing. But for fragrance-free, I find the smell "stinks". I won't buy this one again. I have used this product in the past and really love it. My hands stand soft and the best part of all is that it is fragrance free which is very important for people with allergies. My wish is that it could be in a refillable container and that we could purchase large containers to use as refills.